For Temperatures to 500 °F (260 °C). A Series CT Pumps are available in a Jacketed Seal Cavity. Designed for pumping hot oil, hot water and heat transfer fluids in common use in high temperature while in heating or cooling applications. This feature greatly extends seal life in high temperature applications. 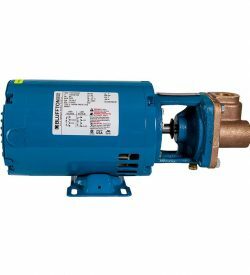 To order, add suffix “J” to pump catalog number for temperatures below 400°F (204 °C) and add suffix “JK” to pump catalog number for temperatures over 400°F (204°). Example: 5CT5MJ. In conclusion see Section on High Temperature Pumps for more information.